Eyebrows are one of the most important parts of the face, in my opinion. A lot of people like to go to shops to get their brows waxed or threaded. Personally, I like doing them myself. The first time I ever plucked my brows, it was a disaster. Actually, it was a disaster a ton of times following that. They were either too thin, too short, didn't frame my face well, had a weird shape, etc. But after a while and many failed attempts, I finally have it down to a tee and know how to get my eyebrows to look the way I want them to. A few years ago, it was strictly tweezers only. That was until I came across some videos of other people doing their eyebrows and found out that you were supposed to cut the length of the hairs. So to do that, I comb through them with a spooly a few times, then hold them with the brush upwards, and trim them a bit. This actually makes a big difference in how your brows look and I make sure I do it every time I groom my brows. The most important part, though, is getting rid of any stray hairs. Again, a few years ago, I would only use tweezers but it would take forever. And that's where the Tinkle Eyebrow Razors* come in. These razors are a game changer. What would usually take around an hour for me to do is easily turned into a 15-20 minute job. 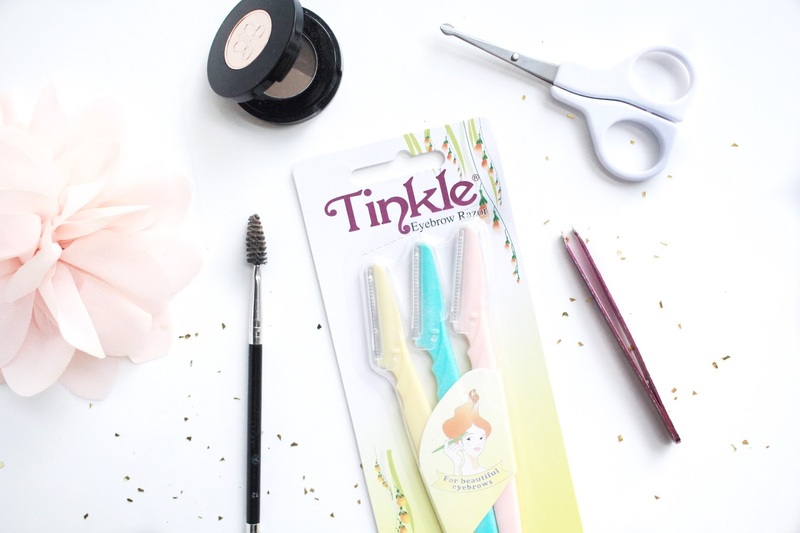 The Tinkle Razor allows me to rid any stray brow hairs with complete ease. It gets rid of the finest hairs, so I'm always left with a fresh looking brow every time. On my first go, I had absolutely no trouble controlling it as it was extremely easy to use. With that said, if you're a newbie, I don't think you'd have any problems using it on your first try. When I'm finished and it's time to store it away, it comes with a safety cap so I don't have to worry about accidentally cutting myself on it. Another use I get out of this razor is shaving the extremely fine hairs on my face. Yes, I do shave my face on occasion. It might sound new to some, but it's actually very common and is becoming very popular. Shaving the fine hairs of your face results in better makeup application. My face looks extremely smooth and glowy when shaved. Also, with this razor, you do not need to worry about the hairs growing back thicker (contrary to popular belief). I can vouch that the hairs grow back the exact same based on the multiple times I've shaved them in the past. Overall, I cannot recommend these razors enough! I will never go to a store to wax or thread my eyebrows again knowing that I can achieve my ideal brow at the comfort of my own home with this little tool. They are a time saver and work effortlessly to give you the perfect brow. If you want to try some Tinkle Razors, you can purchase them on the Tinkle Your Face website for a very affordable price. What method do you use to groom your eyebrows? Would you try shaving them?